bearbrick love: anybody out there? I was checking my email last week when I heard my business partner S (who was reading the newpaper) say, "A new planet's been discovered – doesn't that make you think we may not be alone in the universe?" Could she have been referring to the planet named WASP-17 which was discovered by the UK's Wide Area Search for Planets project in collaboration with the Observatory of Geneva last August 2009? The planet, which is approximately 1000 light years away in the constellation Scorpius, is said to be twice the size of Jupiter. Planets (like Earth) are thought to form when dust particles and gases around a newly-formed star gather to form rocks. "The dust bunnies under your bed grow in a similar way." said Scott Kenyon, a planet-formation theorist at the Harvard-Smithsonian Center for Astrophysics. "And after a million years, a dust bunny can get pretty big." So that explains the planets. But not the human race. 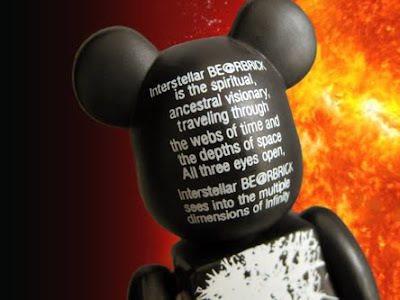 (Top pic) The Interstellar Bearbrick, a rare secret bear from Series 17, was designed by Gustavo Alberto Garcia Vaca of Chamanvision Visual and Literary Art Studio. It was inspired by "Interstellar Transmissions", Vaca's art book of digital images inspired by Jazz, Detroit Techno, Hip Hop, Electro and Funk – music by various artist that were built on themes of time and space. According to his website, "Vaca is a visual artist/writer working in various mediums including digital, writing, drawing and photography. His artwork is exhibited in art galleries around the world, including Parco Museum in Tokyo, Japan and the Museum of Emerging Science and Innovation in Tokyo, Japan. His writing is published in literary journals, magazines, books and anthologies including Dance the Guns to Silence. His photography is published in various art books including Graffiti World: Street Art from Five Continents." Ariel, it was a new SOLAR SYSTEM the scientists discovered :-) Which means Earth may have a twin planet out there, WITH inhabitants that may just look uncomfortably familiar, he-he. 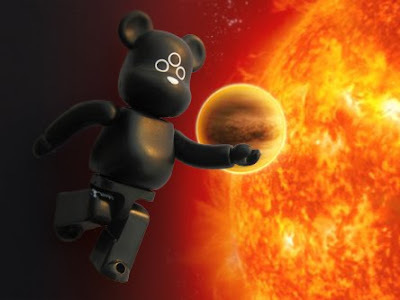 I love your Interstellar Bearbrick. I don't mind having a 400% of that. OMG DUDE I HAVE THIS BEAR!!!!! DO you know how much this would be worth since i own it? ?